﻿ E-ink-Reader. Repair you e-book reader. In this section we are going to place information about methods of repairing of electronic books yourself. We pay your attention at the fact that you should have certain skills of using the easiest measuring instruments and soldering equipment. ATTENTION: the authors don't bear responsibility for disturbances of working of electronic books, which appear after using this information. Everything you do is at your peril! Using these materials on practic shoots your electronic book with warranty! Place your own notes about methods of repairing of electronic books in our forum and we will publish them on this page with indicating the author. Lbook V5 problems with charge. External signs of malfunction: the charge of a new batteryis enough only for a few hours. Indicator of condition of a battery shows different number of stripes, sometimes less, sometimes (in a few dozens pages) more for one or two stripes. Lbook V5 Rprog has typal value 2000 ohm. So, when your device is charging from power unit (not from the computer!) voltage at pin 20 of the order of 0.98 volts corresponds to a current of battery 500 milliamperes. When the voltage at the battery is higher than 4.1 volt, the chip "believes" that the battery is almost charged and further charge occurs with a small current about 30 - 60 mA for 2 hours, not to damage the battery. To analyze the the reasons of malfunction was measured voltage Vprog when knowingly discharged battery was charging (voltage in it was 3.56 volts). Originally this voltage was near 0.98 volts, which corresponds to a current of 500 mA charge, but after 20 minutes Vprog voltage dropped to 0.07 volts, which corresponds to the current charge of 35 milliamps. Battery could not be charged almost completely during this time. 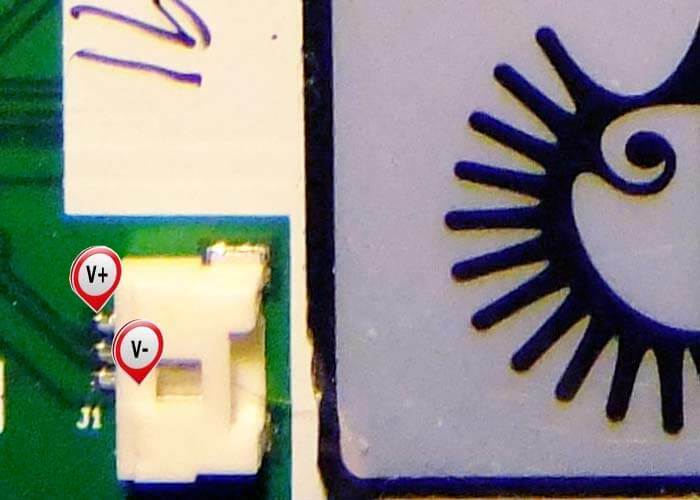 We measured voltage at the contacts of the battery connector (extreme conclusions on the picture), and it was 4.12 volts. Then, using two needles was measured voltage directly on the red and black battery cables, it was equal to 3.68 volts. 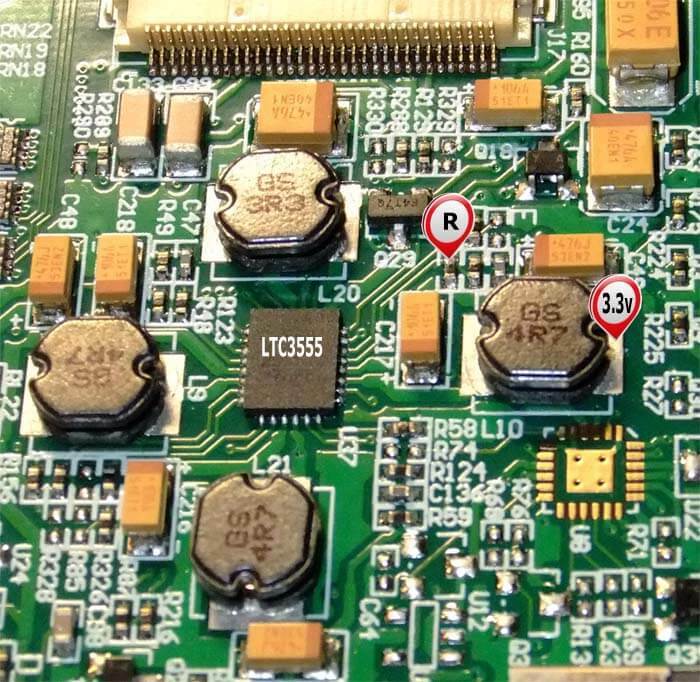 To sum it up, the reason of mulfunction is only the bad contact in battery connector. Plug of this connector on the battery should be disassembled and bend the contacts. After this procedure your electronic book will work normally. External signs of malfunction: constant rebooting and hovering of electronic book. This mulfunction can be associated with mulfunction of flash-memory or with unsuccessful firmware, and can also be indirectly connected with power supply controller LTC3555 фирмы Linear Technology. We'll consider this case. The reference of voltage pulse converter circuits are formed by a voltage divider which consists of two resistors. Over time, the value of resistors and the output of voltage changes also "crawl" from the nominal value. In our case, the voltage of 3.3 volts turned too low. To pick it up, we decided to increase the value of the resistor (R in the picture), not soldering it. We took the smallest Nadfil, and the resistor was very carefully slightly undermined by the middle of the left side. Every two movements Nadfil were interrupted for connection of battery, turning on the device and the measurement of voltage of 3.3 volts. After installing of nominal value of 3.3 volts unprompted rebootings of the device stopped.